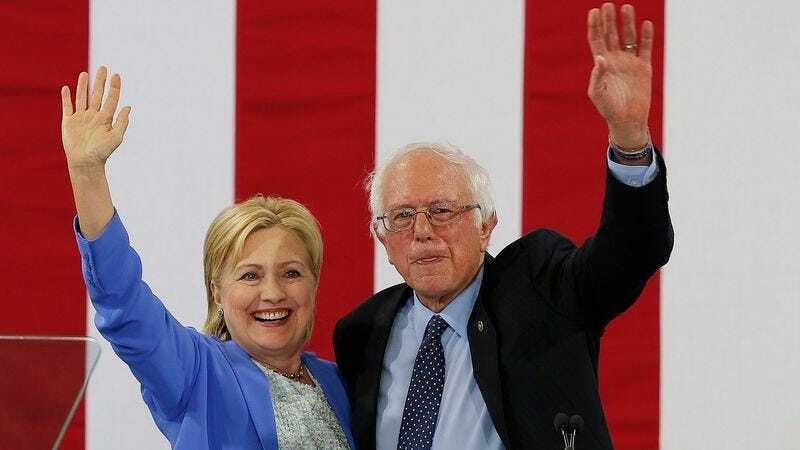 PORTSMOUTH, NH—Following a closely contested primary election cycle that left him several hundred delegates shy of securing his party’s nomination, Vermont senator Bernie Sanders agreed to drop out of the race for president Tuesday in exchange for a 13-hour speaking slot at the Democratic National Convention, sources confirmed. “After discussing matters closely with the Clinton campaign and members of the DNC, we were able to reach an agreement by which Sen. Sanders will suspend his bid for the nomination, and in return, will receive an opportunity to speak on the convention’s main stage from 1 p.m. Tuesday, July 26 to 2 a.m. on the 27th,” said Sanders campaign senior advisor Tad Devine, noting that according to the terms negotiated, the first eight hours of the continuous speech would cover wealth inequality, while the remaining 300 minutes would be split among education, health care, unions, and a number of other issues. “While we were initially offered four hours spread over multiple afternoons, we were insistent that anything less than 10 hours of uninterrupted speaking time was not sufficient for Sen. Sanders to share his vision for the country that has compelled so many people to stand with him this election season. Ideally, the senator would have been able to talk for two consecutive days, but we determined this was a reasonable compromise.” Devine went on to say that Sanders and his speechwriters will have to be very methodical about constructing their message, since under such time constraints, every word will have to count.